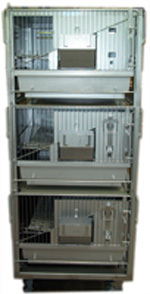 Interconnecting cages based on the UNO Rabbit Cage Racks. The doors are replaced by doors with protective metal sheets. The plastic shelfs are replaced by stainless steel shelfs. The plastic bottoms are replaced by stainless steel bottoms.